Last post to wrap up my trip in Japan is going to be about all the random snacks I had along the way. First up, was MOS Burger near the Shibuya station. We grabbed a quick bite here while waiting for our Airbnb host. MOS Burger is a fast food chain and the second largest in Japan after McDonald’s. I got the beef, onion and cheese melt. Tons of flavour from the onions and the cheese was really good. In the mornings, we would sometimes go down to Family Mart to grab a quick snack. Family Mart is a convenience store, similar to 7-Eleven. We got the onigiris, which are rice shaped like triangles and wrapped with seaweed. Inside, they are filled with different ingredients, but ume or pickled plum is probably the most common. I chose the Spicy Tuna Onigiri, which was super delicious! It’s under 200 yen for one as well! Such a steal. At Family Mart, we also found many alcoholic beverages. We got this lychee cider, which was so good! Wish we have this in Vancouver. Only 4% of alcohol content, so the lychee fruity flavour really comes through. We also checked out Tokyu Food Show, which is connected to the Shibuya station. It’s located inside the Tokyu Toyoko Department store and offers many different stalls with food. We decided to get some nigiris at one of the stall. Here is the Tuna Nigiri, which was slightly disappointing. It wasn’t as fresh as the ones we had in restaurants and slightly overpriced. We also got the Geoduck Nigiri, but it was only alright as well. All the ingredients didn’t seem very fresh for the price we paid. Hokkaido Milk is very popular, so we had to give it a try. Hokkaido milk has a very unique taste and is very creamy, but light at the same time. It has to do with what they feed the cows. You could definitely immediately taste a distinct flavour, which was very good! While in the Harajuku area, we got hungry and spotted a crepe kiosk. It’s called Cafe Crepe Harajuku, and offers many pretty looking crepes. We chose the Matcha Tiramisu Crepe. The crepe was thin and filled with a slice of matcha tiramisu, topped with whipped cream and matcha powder. It was actually very good! Not too sweet! While in Yokohama, I picked up this super cute bag of ramen at a shop in World Potters. It features the Sapporo Maruyama Zoo Bear. So cute! I have yet to try it, but hopefully it’s as good as how the package looks! At the Cup Noodle Museum, we purchased this cute box of ramen. You add eggs on top of it, and it’s supposed to be sort of like a ramen pancake. However, we made it the other day, and it kind of failed. Definitely did not look as good as the picture. Perhaps it was because we couldn’t read the instructions properly. It wasn’t bad though. At the Narita International Airport, we did some Duty Free shopping. We picked up this bottle of Sparkling Ume Wine. The packaging definitely caught our attention. We had it on the plane and it was really good! Sweet and fizzy! 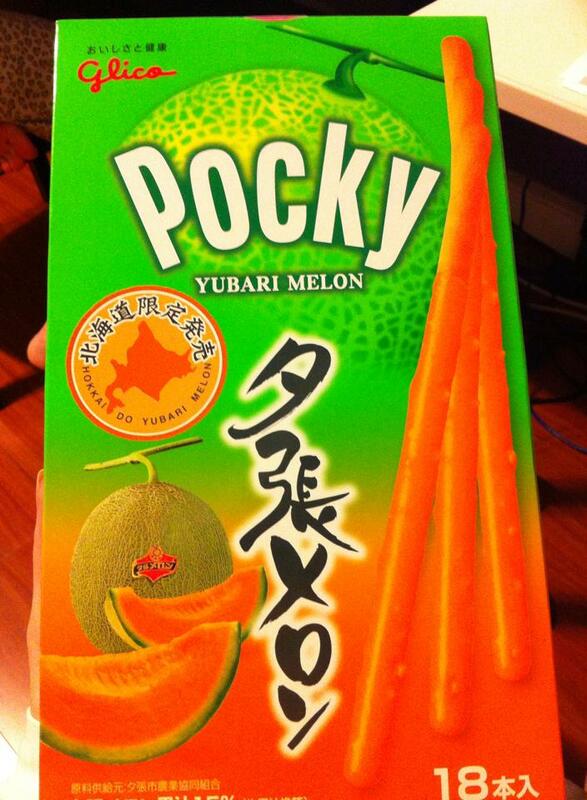 We also picked up a box of the Yubari Melon Pocky. They were the giant Pockys, so they are individually packed inside. It actually had a very strong cantaloupe flavour. Yummy! At the Narita International Airport, after you pass security and customs, there isn’t much to eat in our terminal. We ended up having a last meal of Japanese food. K got the Soba Noodles which came with a side of fried potato croquettes. This probably shouldn’t be in this post, since it was a Korean snack we bought, but I’ll throw it in here anyways. These were banana puffs! Crispy and light chips with a strong banana flavour. It’s weird how Koreans make banana flavoured everything… So weird, but so good. We found it at Walmart in Vancouver! And here were our suitcase filled with our goodies. Just some of them actually… A trip to Asia isn’t complete if you don’t bring back tons of goodies! After dinner, the boys took us to look for some fruit soju! We took a 10 minute walk and ended up in a street full of bars. And this was a random Wednesday night, but the street was busy! Shows how much Koreans love to drink! Anyways, we ended up Warawara, which is supposed to be famous for their fruit sojus. The dining bar was in the basement floor, and the decor is all wooden. I liked how they had little rooms with blinds separating you from other diners so it gives you some privacy. Apparently, you must eat when you drink! It’s drinking etiquette to always order at least one dish to share. They say that’s how they get drunk, since you keep eating, and so you’ll drink more… Anyways, we ordered the Italian Creamy Fried Chicken, which was by far my favourite fried chicken we had in Korea. It definitely had to do with the creamy and cheesy sauce! I had thought that the best fried chicken would be the classic, but they really know how to fusion up their classic fried chicken. They were little chicken balls that were boneless, so no hassle with deboning. Filled with vegetables like corn, peppers, broccoli and onions, the dish was extremely flavourful! Then came our fruit sojus! What’s cool about this bar is that they actually use fresh fruit to make your soju or other alcoholic drinks. None of that cheap processed juice or powder! What’s even cooler is that they actually present the drink in the fruit’s shell! So here we have the server actually physically bring us all the equipment to make the soju. His blender was filled up half with soju already. He then pulls out the pineapple with a metal tool. He then actually blends the whole drink in front of us! Super cool! Plus, you’re guaranteed it’s fresh! The pineapple soju was so good that we had to get another round of soju! This time, we chose the Watermelon Soju. Unfortunately, they said they ran out of the actual watermelon skin for the bowl, so we were only able to get it in a jar already made. I’m not sure how that works out though, because where did the watermelon come from if there’s no shell for it…? Odd… Again, super refreshing! These fruit sojus are a must try if you normally like calpico sojus that are flavoured peach or grape and such. Never thought these fruits would be so great with soju! We mentioned how we liked the Korean beers, since it’s really light and diluted, so the boys taught us how they normally drink their beers. This time, we tried Cass, which is also a popular Korean beer. Typically, you can make soju bombs by dropping a shot glass of soju into a pint of beer. Instead, the boys just poured the soju into the beer. They then took a spoon and poked the drink through, and somehow the drink just mixed itself together. Pretty neat!! And here is what it ended up like! Some foam at the top, and the beer and soju mixed up! This definitely gets you more drunk quicker! Overall, an absolute fun night to finish off our trip in Seoul! Can’t wait to visit these crazy boys again. Warawara is definitely a great place to hangout and have a few drinks in a comfortable environment! If you’re not a heavy drinker, those fruit sojus are perfect for you! I believe they have several franchises all over South Korea, so it shouldn’t be hard to find one! On the last night of my stay in Seoul, I met up with my Korean friends, D and S, whom I had met during exchange. Can’t believe we saw each other again in less than a year! Anyways, it was pouring rain that day, and they said to meet at City Hall Station. They were going to take us to a restaurant famous for pig feet, but unfortunately there was a huge lineup. It was this tiny alley filled with restaurants, and even though it was flooding and pouring rain, people were still out eating! We ended up going to the second floor of a building for barbeque food. Once I entered, I immediately realized that they were mostly business men who had just gotten off work. The restaurant is very casual, with just tin chairs and tables and little to no decoration. We settled down, and we let the boys do the ordering. First off, we got Bulgogi, which is marinated beef. It came on top of a hot pot grill and topped with lots of green onions. I didn’t think it would be too special, but the marinade was so delicious! We were also given lettuce leaves to wrap them in and it tasted great with ssamjang (hot pepper soybean sauce). On the table, we also have some complimentary appetizers, like kimchi, garlic, bean sprouts and radish. The plastic bottle was Makgeolli – the Korean rice wine that we loved! This was the cheaper version since it is commercialized for supermarkets and convenience shops. Still, very yummy! Next, we had a Spicy Bulgogi. When I initially saw it, I freaked out since I was scared it would be super spicy. Luckily, these were not as spicy as I had imagined. It also had a hint of sweetness to it. The sauce was so addicting, and simply having green onions grilled along made the dish perfect. The beef was so tender! In the back, we have a half eaten Steamed Egg. Very simple with just green onions, but it was a great side dish. Other than barbequed food, we also got the Kimchi Tofu Soup, which was sizzling in a hot stone pot. Slightly spicy due to the kimchi, and filled with soft tofu. Very appetizing and was delicious mixed with rice! Lastly, we ordered the Grilled Pork Belly, which is a very famous dish in Korea. It is called Samgyeopsal in Korean and has just the right amount of fat to meat ratio. They come in long slices, and as you grill, you can snip it into smaller pieces with scissors. They are delicious when eaten with ssamjang and wrapped with lettuce. Extremely delicious!! Overall, this restaurant was way better than expected! The interior may not be anything special, but the food is really good! We payed less than 20,000 won each too! I wish I had gotten the name, but it was pouring rain and I just followed my friends, so I wasn’t into the whole blogging mood. A trip to Seoul isn’t done properly if you don’t have some street food! I was actually surprised that there weren’t as many street food stalls as I had imagined. Anyways, if you’re looking for street food, Myeongdong is a good option since you can shop and eat. However, most of the stalls don’t come out until the evening time. I love grilled sausages, so this stall caught my eyes immediately. This sausage skewer isn’t your typical American sausage skewer. We had some spicy beef sausages, but there were also pork sausages that were filled with rice cake! I thought that was pretty neat! Yummy too! Another stall in Myeongdong offered a large variety of grilled squid, octopus, and fish. Some seemed to already be grilled, while others needed to be grilled. We had originally wanted to get grilled squid, but we couldn’t really figure out what was written on the signs. I believe that we ended up ordering grilled octopus. They placed these slices on the grill right away for a few minutes to heat it up. Honestly, these were terrible! They were so hard and tough that I’m pretty sure I had a difficult time digesting it. Won’t recommend this! Another area with lots of street food is the Dongdaemun area which is filled with shopping malls like Doota and is filled with many wholesale shops. We found a stall with more sausage like skewers. These were dipped in a red sauce! On the left is a fish cake wrapped around squid. To the right, I got a skewer with a variety of sausage, rice cake, fish cake, and meatballs. The sauce was not even very spicy. It was more sweet than spicy. Cheap and delicious! O’sulloc Tea House is a modern looking tea house that offers Korean traditional teas. It specializes in green tea, but also offers many other items like ice cream, desserts, and juices. They have several shops, but we stopped by the one in Myeongdong. I decided to share the Green Tea Parfait with K. The parfaits are quite expensive, at more than 8,000 won! Honestly, I didn’t think it was that good. The bottom was green tea ice topped with lots of whipped cream and red bean. It was then topped with a scoop of green tea ice cream, some green tea cake, and a tea biscuit. We found that the parfait just tasted like cream. I would’ve much preferred the parfaits at Mimibuloveme in Vancouver. I find that O’sulloc is overrated with high prices! I know they specialize in green tea, so I’m guessing their teas are probably more on the right track. Definitely not going back for the desserts though. On another day, K and I went out early in the morning and walked over to Insadong to look for some quick breakfast. We ended up heading up to this random cafe on the second floor of a building. I never got the name, but it was filled with office people! It’s more like a fast food/ cafeteria type of setting but still with full service. I chose the Dumplings in Oxtail Soup, which was absolutely delicious! Filled with roughly 6 dumplings, and topped with onions, seaweed, and egg, the broth was the best part! It didn’t taste like MSG, but rather a hearty broth filled with flavour. As for the dumplings, they were pork and chive dumplings, and a great way to start the morning! Must try! We also found Tteokbokki with Cheese on the menu and thought it would be quite interesting. Unfortunately, it was a bit of a disappointment. There wasn’t enough cheese on it! They definitely skimped out here. There were only a few strings of melted cheese, but not enough to create a cheesy effect. The rice cakes were soft, and sitting in a spicy hot pepper sauce, and topped with white sesame. It also came with half a hard boiled egg. Overall, these were just decent. I would highly recommend trying their soups instead, since most of the locals were ordering that. After doing some night shopping in Myeongdong (again), we got a bit hungry. At the end of the Myeongdong street, we found a chicken and beer restaurant. We still hadn’t had chicken and beer in Seoul! We decided to go into Chir Chir Fusion Chicken Factory. It had a large selection of chicken dishes. The first level was for smoking, and the second level was non-smoking. The restaurant is actually quite huge and it was very packed. We wanted more of a snack, so we decided to order one order to share. It’s pretty huge! I believe there were roughly 8 pieces of chicken, so it’s perfect for 4 girls. We wanted something original, so we went for the Crispy Classic Fried Chicken. When I saw it, I thought it looked quite similar to KFC’s, but after eating one, I can see why people love their Korean fried chicken! The flavouring is so much more delicious! Plus, it didn’t feel too oily! Lightly battered so that it was crispy. It came with two sauces – a tartar sauce and a sweet chili sauce. It was delicious without the dipping sauces! I liked how it wasn’t too salty, and by the end of the night, I wasn’t even really thirsty. That’s always a good sign! All orders come with some side dishes as well. It came with some salsa (which I really didn’t like because of the cilantro and raw onions), some corn, and some crackers. Wish we had gotten some beer to go with it, but we felt that they priced their beer a bit too high. I guess that’s how they make their money here! After exploring the Hanok Village, we decided it was time to relax and grab some desserts! Our Korean friend took us to 인사동 반짝반짝 빛나는 in Insadong. I don’t believe it has an English name, but it’s a Korean traditional tea room on the second floor of a building. The inside is decorated with many of the pottery that are handmade next door. Pretty neat! Their popular menu items are the smoothies. I wasn’t too sure what it was at first, but it ended up to sort of be like a sorbet icy. We started off the Omija Smoothie, which was a light pink colour. Omija is also known as five flavour tea and is made from the fruit herb. It’s essentially like a iced smoothie, but in a thick form. Super refreshing and helped quench our thirst. The flavour was a mix of sweet and sour. Next, we also got the Citron Smoothie. I believe it was really yuzu. It was topped with citron peels that had been candied. Again, the hint of sweet and sour made the smoothie very refreshing. This was probably my favourite flavour! The third smoothie was the Sweet Pumpkin Smoothie. This one didn’t feel as icy and refreshing, but rather a bit more filling. It was mainly sweet with a strong pumpkin flavour. Other than the smoothies, we also tried some traditional Korean snacks. This one was similar to a mochi and was dusted with roasted soybean powder. Chewy and quite interesting and unique! It came with two dipping sauces – one was a citron sauce, while the other was crushed peanuts with honey. We also had the Ginger Sweets, which are also known as Yugwa or Yumilgwa. These were just as good as the ones at Mok Hyang. Very light but still remained the chewy texture. Lastly, to finish off, we had the Jujube Tea. It came in a pot and smelt really good! Jujube is a Korean date and is slightly sweet. A great way to end our dessert meal! I highly recommend checking this tea room out. It even had guestbooks where you can write a message or mark down that you’ve visited. We too, drew a little picture to remember that we were here! I wonder if it will still be there when I visit again. The next day, we met up with K’s friend who studied in Vancouver but went back to her homeland in Seoul after graduation. It was great to have a local take us around Bukchon Hanok Village, which surprisingly was just right near our home! The Hanok Village is in the Samcheong-dong neighborhood. She took us to Hangaram, which is a cute little restaurant that serves set menus. You can also order a la carte if you wish. There are rooms where you must remove your shoes and sit on mats. It makes you feel like you’re in a traditional Korean house. First, we ordered the famous Makgeolli, which is a traditional Korean alcoholic beverage. This is made from rice or wheat mixed with a Korean fermentation starter called nuruk. Our makegeolli came in a tea pot and when poured out, it has a milky creamy white colour. It doesn’t look like your typical alcohol! I absolutely loved this! It’s a little sweet, but doesn’t have a strong alcohol taste to it. I found it much like a dessert drink! It’s actually around 6-8% in alcohol content, but doesn’t taste like it. Before drinking, you should also swirl your cup first since the cloudy substance tends to settle at the bottom. A definite must try in Korea! We ordered the set menu, so everything came with the portions made for the 5 of us. Some dishes, like this one came in 2, so you actually get quite full from the set menu! The Salmon Sashimi Salad was very refreshing. Thinly sliced salmon that reminded me of smoked salmon were topped with a mix of greens and sprouts and topped with a fruity dressing. Next up, this dish also came in 2 plates. On the left is Japchae, which was flavourful and strong in sesame flavour. On the right were Fried Shrimp Cakes, which were a little spicy and lightly battered. Yummy! Then, we had the Pork Belly Wraps. These were so good!!! Thinly sliced pork belly with just the right amount of fat. It came with white kimchi, and this was the first time I’ve heard of this! The white kimchi is not spicy, but still has the sour and pickled taste. You place the slice of yellow radish in it, and along with the pork belly which is dressed in a sesame and sweet soy sauce, this is the perfect match! A bit of crunch, and tons of flavour! Then came the Grilled Fish, which came in a sizzling plate. It was topped with onions, bean sprouts, and more greens. I’m not usually a fan of cooked fish (for some strange reason), but this was quite delicious! The sauce reminded me of unagi sauce, and the fish was extremely soft. I think the sauce really made the dish delicious! The last dish was the Grilled Duck Salad, which was also a favourite at our table. Topped with greens again, the grilled duck were extremely tender! A light soya based sauce was all it needed. A must order! Then came the two hot pots. I didn’t know we would be having so much food! First, was the Bulgogi Hot Pot. This was our favourite out of the two hot pots. It came with japchae noodles (sweet potato noodles), bulgogi beef, enoki mushrooms, and lots of green onions and onions! What made the hot pot delicious was the broth. It wasn’t the typical bulgogi broths, but rather it tasted really healthy! I felt like there were some medicinal herbs in there which gave it a very healthy flavour to it! The second hot pot was the Spicy Seafood Hot Pot, which we all agreed was only average. The broth wasn’t too spicy, but there was a very strong taste of seafood (which I guess is a good thing). It came with clams, little shrimps, tiny crabs, some noodles and enoki mushrooms. This was probably my least favourite dish for the lunch. They also provide you with lots of appetizers – some that aren’t as familiar to me. It came with some kimchi, radish, chives, and quail eggs! We especially loved the quail eggs. It was a good touch since we don’t usually see them being served as complementary dishes. Lastly, we were served dessert, which was the famous Sweet Pumpkin Soup. Koreans love to use pumpkin as an ingredient in their food. The soup is more like a tea and is slightly sweet with a strong pumpkin flavour. Perfect for pumpkin lovers! Overall, we were extremely satisfied with our lunch at Hangaram. It may be a little pricey at just under 30,000 won per person, but you will be guaranteed to be full! It’s a great experience to try so many dishes with good portion sizes as well! To be honest, we finished most of the food, other than the rice and a bit of the hot pot. After lunch, we wandered around the Bukchon Hanok Village, which is located near many of the famous palaces, like Gyeongbok Palace. You take a walk up a steep street, and you will find yourself in a street full of traditional houses or hanoks. I believe that this village used to be where the top government officials used to live during the Joseon Dynasty. The architecture here is absolutely beautiful! Feels like you went back in time in Korea! The roads here are all very narrow and steep. If you go to the very top, you can get some views of the city (although Seoul is always quite gloomy and foggy)! On this trip, we really didn’t do a lot of sightseeing in Seoul, because we aren’t interested in palaces and such, but if there is one sightseeing stop you would like to make, Bukchon Hanok Village is surely the right one! I believe you can pay to go into some of these houses too. After all the exercise walking up the village in the burning sun, we stopped by a little stall to get Sikhye. Our Korean friend told us that this is a traditional Korean drink and is made of rice! There are grains of cooked rice at the bottom and the drink is sweet and refreshing! It’s a drink that supposed to help with digestion! Perfect after a big meal. They now sell Sikhye in cans at supermarkets, and I actually purchased one back in Vancouver at H-mart. However, I have to say that the old granny who was stirring her pot produced much better Sikhye! So sad that I won’t be able to have this now that I’m back in Vancouver! Shaved ice or patbingsu is what Koreans rave about when they talk about desserts. But to be honest, I was sort of getting sick of shaved ice… It constantly gives me a brain freeze and I was just tired of having it all the time. Were there any other Korean desserts other than shaved ice?! Well, we stumbled at Sulbing (설빙), which is only written in Korean on their signage. On the side, it says Korean Dessert Cafe. Since we could only read the English, we decided to go there and hope for some other desserts. Upon arriving, we saw more shaved ice… Seriously?! Well, we were tired from all the walking, and just wanted to sit down. The place was bustling with a self serve type of system. We found the only seat available and sent one of our friends to go order. We decided we would share one shaved ice between the four of us. They have the buzzer system here, so you get notified when your food is ready. To our surprise, it wasn’t the typical patbingsu! It was Sulbing! Sulbing originated in Busan, and essentially means “snow ice.” Similar to shaved ice, but the ice are shaved so thin, that they are like powdered snow! None of that crunchy texture, but a powder of snow that just melts in your mouth! Absolutely delicious! We ordered the Berry Sulbing, which came with blueberries, raspberries, and dried cranberries. All sulbings come with condensed milk, which you drizzle on top to add sweetness to your dessert. So delicious! This is a must try if you’ve already tried the typical patbingsu. They are around 9,000 won each but comes in a huge bowl and is perfect for sharing. They also have a Cheese Sulbing which I hear is surprisingly really good. Definitely looking forward to trying that next time I visit! The cafe also offers many other drinks and food items like toast. You can find Sulbing Dessert Cafe at many locations around Seoul and Busan. We ate at the one in Yeongdeungpo-gu, but pictured above is the location in Myeongdong.